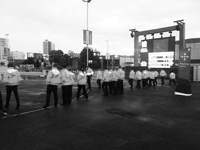 With the growing requirement for response team staff at events, Elite designed the first Event Response Officer’s qualification. This qualification enhances response teams and event supervisor’s knowledge and capacity to operate safely and competently in today’s event industry. The syllabus will enable delegates to effectively and efficiently supervise and be part of response teams at events. The syllabus covers areas including Pit Operation, Evidence Handling, Body Camera and CCTV recording, Control and Restraint Intervention, Handcuffing, Proficient Searching of Areas and Persons and all necessary Legislation and Guidance. Assessment for this course will be in the form of a work book and on-going assessment of work based learning. The duties of an officer when working in the front of stage pit area. In the future, we hope the Response Officer Qualification will become very much a necessity within the industry as opposed to a desired qualification to have. In the future companies and organisations will benefit both financially, improving their bottom line performance and operationally by developing and training reliable sustainable response teams which in turn will benefit the company’s image and standing within the event industry and aid future tender opportunities.